Tourism Ireland is launching its first new global advertising campaign in seven years as it targets new markets in 2019, the year Brexit hits. The new campaign, ‘Fill your Heart with Ireland’ will include TV, print, outdoor and online ads. “It will be launched in 20 countries around the globe; in Britain it’ll be launched on St Stephen’s Day on ITV, Channel 4 and Channel 5,” Niall Gibbons, CEO of Tourism Ireland, said at the launch event in Dublin’s InterContinental Hotel. He conceded that it’ll be “an uncertain market in 2019”, given the backdrop of Brexit, but the campaign will also target the key market of the US, and be “running coast to coast on channels like ABC, NBC, and around the Ellen de Generes Show and Jimmy Fallon Show”. 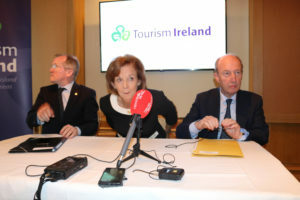 Mr Gibbons said revenue generated from international visitors is set to his €6.1bn for 2018, with 11.2m people visiting the island of Ireland, up 6pc on the previous year. On VAT, he told reporters that while his Department was against raising the hospitality rate from 9pc to 13.5pc, his own pre-budget idea of a VAT rate for booming city hotels wasn’t practical.